Moscow believes the West has more influence on various paramilitary forces in Ukraine - sponsored by local oligarchs - than Kiev does, Russian FM said citing the latest bickering between Right Sector and the Interior Ministry. “The authorities in Kiev are not in control of the numerous paramilitary forces, including Right Sector, which, we estimate, comprises a large portion of the National Guard. 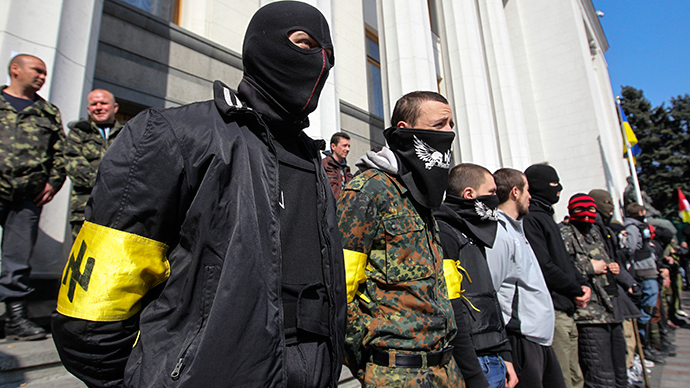 The demarche of Right Sector towards the Ukrainian Interior Minister speaks for itself,” Sergey Lavrov said, adding that existence of armed groups sponsored by Ukrainian oligarchs, such as the Azov and Dnepr battalions, poses a great security threat. “We work with our Western partners in Europe and the United States who can really influence those paramilitary units that don’t answer to the central government in Kiev. We know the West has such influence,” he added. Lavrov was referring to the weekend ultimatum of the far-right group, which threatened to pull out its troops from eastern Ukraine and march on Kiev unless President Petro Poroshenko fires several police officials, including a deputy interior minister. The group later reduced its demands, saying that the release of its activists previously arrested by the police was sufficient. 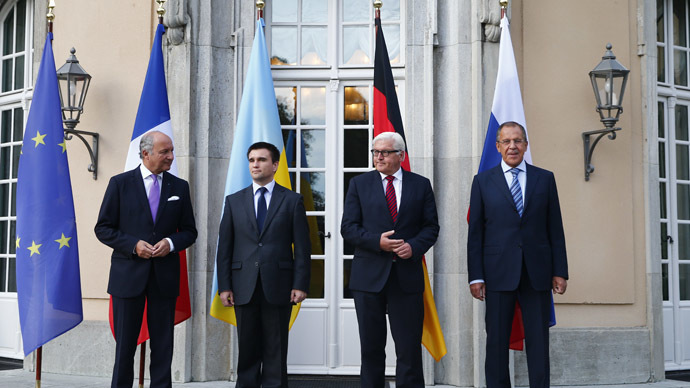 The comments from the top Russian diplomat came as he reported on the progress achieved during the Sunday meeting with his counterparts from Ukraine, Germany and France. The roundtable produced no concrete agreements, but the parties involved said some progress was made on the issues of humanitarian aid and border control. Speaking to journalists on Monday, Lavrov said Moscow would welcome the observer mission of the Organization for Security and Cooperation in Europe (OSCE) deploying drones to control the Russian-Ukrainian border from the Ukrainian side. Lavrov said Russia is working with the OSCE on giving more transparency in the border region, which is important, considering how often Kiev voices false reports on alleged violation of the border from the Russian side. He cited the latest claim by Kiev on Friday, when the Ukrainian military said it had destroyed a column of Russian armor after an incursion into Ukraine. Russia has sent a convoy of humanitarian aid meant for war-torn eastern Ukraine. 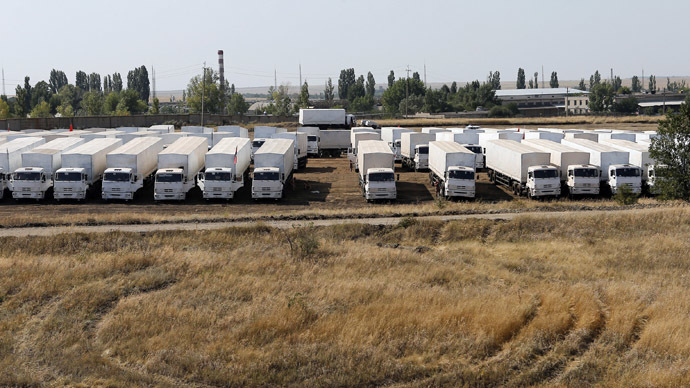 The trucks have not been allowed entry by the Ukrainian side, which voiced suspicions about the nature of the cargo and demanded that the delivery be conducted by the International Committee of the Red Cross. 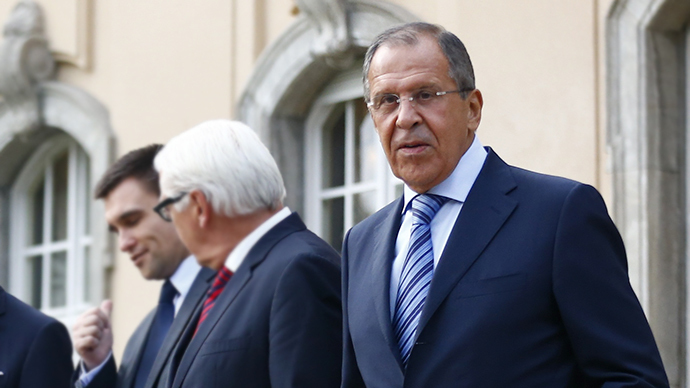 Lavrov noted that the media hype over the mission, which was apparent in the West in its early days, evaporated as soon as it became clear that the column actually carries humanitarian aid and is not some kind of a trick used by Russia to invade Ukraine, as Kiev initially claimed. “As long as the authorities in Kiev bet on the use of force and consider a military victory over their own people a necessary condition for keeping themselves in power, I don’t think any good will come from what we are trying to achieve,” he said.